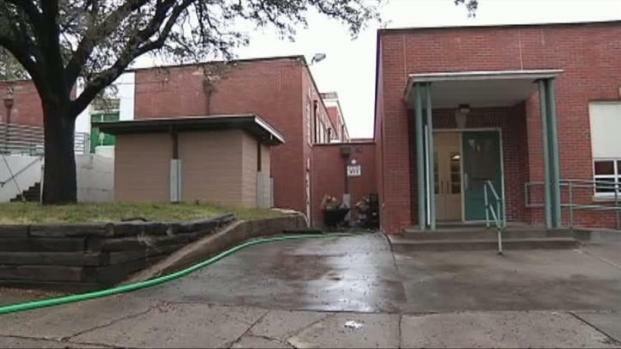 Heavy rains flooded the kitchen at Hi Mount Elementary School in Fort Worth Wednesday morning. Officials with the district said flooding in the kitchen is not uncommon when heavy rains swell beyond the capacity of drainage canals along the 4100-block of Birchman Avenue. An email from a viewer said the water level in the kitchen reached the knees of the workers, but officials with the district said the water flowed in through the floor drains and really only rose to a height of an inch or two. Chopper 5 flew by the school and spotted crews working hard to direct the floodwater out of the building. With floodwater comes unsanitary conditions. Unable to prepare hot food, cafeteria workers served a cold breakfast of prepackaged foods, such as cereal, that met the health department's approval. A hot lunch was prepared and brought in from another campus. Water flooded the kitchen of Fort Worth's South Hi Mount Elementary on Tuesday, leaving workers -- and neighbors -- to fight rising water. Once the health department gives their approval, the kitchen facilities at Hi Mount can once again be used to prepare food. District officials said the cafeteria remained dry and did not report any other area of the school impacted by flooding. NBC 5's Andrew Tanielian contributed to this report.